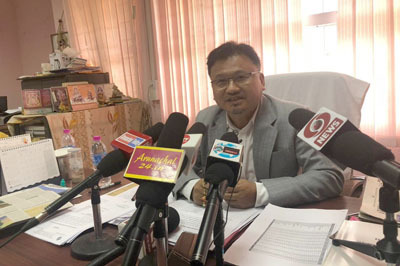 BOLENG, Dec 24: Chief Minister Pema Khandu in a public function here on Monday declared the formal functioning of Siang district with Boleng as its headquarters. The chief minister signed the formal declaration letter and handed it over to Siang Deputy Commissioner Rajiv Takuk. Prior to this, the CM laid the foundation for the district secretariat building, and inaugurated the 2×1500 kw Subbung small hydroelectric project at Supsing village. 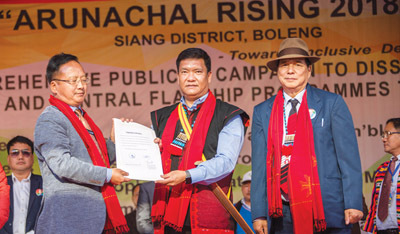 Addressing the public during the launch of the second leg of the ‘Arunachal Rising’ campaign, Pema congratulated the people of Siang district on the start of the formal functioning of the HQ. He also congratulated them on getting the hydroelectric project, and dedicated it to them. “With the launch of the new hydro project, Siang district has achieved the status of a power surplus district,” he said. However, the formal functioning of the district had been delayed due to the question over the location of its headquarters, he said. 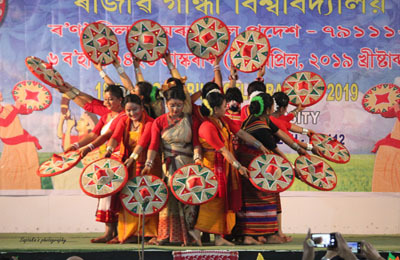 The chief minister said his government does not believe in keeping any issue pending which has the potential to create animosity among people. “The government should have the political will and resolve to solve any issue at the earliest for the benefit of all,” he said, adding that the location of the headquarters was finalized based on the report of the technical committee. Assuring full support of the government for creation of infrastructure in the district headquarters, the CM said budget provision would be made in this regard. He said the matter of whether the government offices under the district headquarters would be established at Boleng or Pangin would be decided after consultations with community bodies and local organizations, and with the approval of the cabinet. The chief minister further informed that the construction of Rasing bridge over the Siang river would be approved by the Centre in the coming days. Responding to public demand, he gave assurance that a new circle headquarters would be created at Nirle. The CM also gave away certificates and prizes to the two ‘most progressive’ farmers of the district.